I’ve spent weeks working with a player helping him to gradually shift toward a more “process-focus” where he is less influenced by who he is playing and what might happen. He seems to be getting it and demonstrates insight into how focusing on things outside his control is counterproductive. Nevertheless, a week after our last session, he loses in the first round of an ITF tournament and I later learn that just before he went on the court, without really thinking, automatically tells his father, “I saw him warming up. I should win this one.” Well, he didn’t. In short, this word “should” is a disaster. Period. It slips its way into our minds, our games and into our conversations. I’ve seen it take over people’s entire approach to competition and is a generous contributor to their misery. And, trust me, I know how susceptible we are to this trap. I’ve been there. But, over time, it has become a six letter swear word for me. Arguably, it is the most destructive word in the alphabet of performance. It serves no purpose, other than to put more pressure on you, to make what you are about to do, or what you already did laden with expectations, judgment, comparisons, and ultimately, more and more misery. The “little mind,” the ego, lives in the world of “shoulds.” But, you are smarter than that. You don’t need to be dictated to by your little brain. It is not a coincidence, that virtually every athlete in every interview, avoids conversation about what should happen, or how they will likely do in the upcoming event. They avoid it because they know thoughts about outcome, placing expectations on something they have only partial control over, is like poison. They say things like, “Well, she’s playing well and I’m sure it will be a good fight. I’m just going to rest up tonight and be ready for the morning. 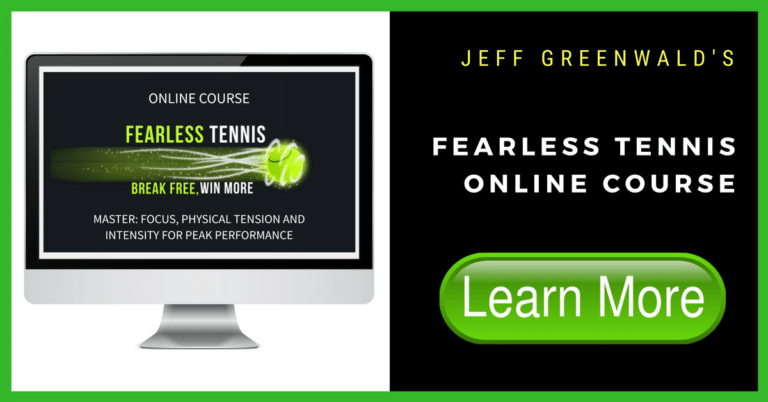 I’m looking forward to it.” One of the major psychological differences between you and the best athletes in the world is that they don’t fall for it as often AND they learn to drop into a more engaged, focused state. In fact, all of their pre-match rituals are designed, in part, to protect themselves from this destructive mindset of expectations and self-imposed pressure that steal them away from what they love–to compete. So, I strongly encourage you to wipe this word away, or anything close to it; blow it up, smile at it when it knocks on your door, shift your focus to something else, anything else. The same goes for when you lose 3 sets points and lose the set. Thinking about what could have or should have happened is human. But getting stuck there is a bad habit. Choose to refocus and get back into reality. There is a lot more tennis to play in your life. Let your wise mind come online and take charge. I know. It’s the most natural thing in the world for your brain to contemplate the fact that you “should” win the upcoming game or match, but every great athlete knows where that line of thinking got them…nowhere very fun or satisfying.